One thing Disney continues to do right is change with the seasons. They have this magical way of making Spring, Summer, Fall and Winter seems extra magical! 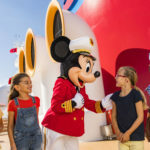 And Fall has arrived and with that comes Pumpkin Mickey Jack-O-Lanterns, Fall Decor at the Parks, and even those hints at Fall Movies in the Disney Vault. 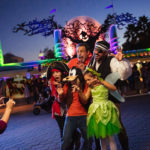 Something that says fall is the American Staple in the Scarecrow and Disney has a variety of Scarecrows that help set the mood for this season of cooler weather, leaves falling, the crisp air, apple picking, and getting ready for all the spooks in the night with Halloween around the corner. So let’s introduce you to some of your favorites to get you into the fall mood. You can’t start off talking about Scarecrows without bringing up our favorite Disney icon Mickey Mouse! Over the years Mickey has worn many costumes and one of the most popular ones has always been the Scarecrow Mickey. I think this is because it is fun, whimsical, and also small children are not too frightened by this. I think it is only second to the Vampire Gothic Mickey in popularity. Scarecrow Mickey has also been seen in many parades, meet and greets and Halloween Promotional Materialss for Walt Disney World. Pumpkin Mayor of Main Street U.S.A. The Pumpkin Mayor of Main Street welcomes guests to the Fall Festivities upon entering the Magic Kingdom at the Walt Disney World Resort. He has that turn of the century Pollyanna feel and really captures the magic of both Disney and that era of Fall Traditions! He is perfectly displayed and is exactly what you think of when you think Main Street U.S.A. and Scarecrow! Yes, how can you bypass one of the original Scarecrows with this icon from the Wizard of Oz Series as well as from the iconic Disney Classic Return to Oz (You can find interviews with both Ozma from the Film, Emma Ridley and also Puppeteer Tim Rose in our Archives at DizRadio). The Scarecrow from Disney’s film brings to life the original sketches from the Oz books and brings it to screen. Although the movie was dark for its’ time, it has gained a cult following over the years. Although some look at it a re-tooling of the Oz books and the original Judy Garland film, it actually brings to life the books in the series as you would have imagined them! And if you are looking to get the full effect, go and read all the Oz Series Books and truly enjoy Dorothy and her friends. This Scarecrow in recent years has been overlooked as younger generations tend to forget the classic Disney because let’s face it, classic Disney to them is The Little Mermaid of Atlantis! So you can’t blame them, but then it is up to us to make sure they don’t go forgotten. The Scarecrow of Romney Marsh was originally a three part miniseries as part of the Wonderful World of Color. the part of the Scarecrow was played by Patrick McGoohan. The series debuted in 1963 and also was cut together for a British release to play with The Sword in the Stone. Now this tale is a complex one, but it is a fantastic story. If you would like to read more about the plot of Dr. Dyn: The Scarecrow of Romney Marsh you can find it here. But one thing is for certain, you can never get that theme song out of your head! And we save one of the best for last as who can forget Jack Skellington from The Nightmare Before Christmas. It is in the early part of the film we see Jack Skellington as The Pumpkin King in his full Jack Skellington Scarecrow Attire. Complete with all the spookiness one could ask for, Jack sets the tone of Fall and Halloween in one swoop. This version of Jack is highly popular as people look to get their hands on one as a POP! Figure, Collectible, Tsum Tsum or more! 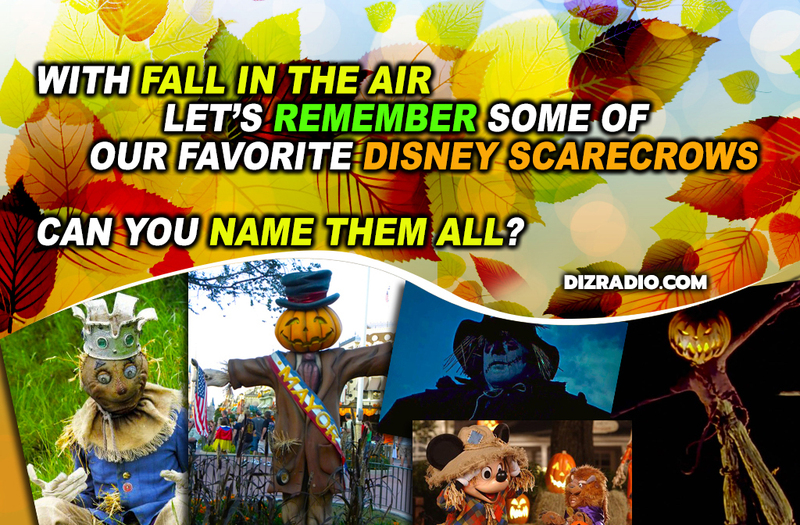 Did we forget any of your favorite Disney Scarecrows? Have you created your own? No matter what, the fall air, the crisp breeze, and the smell of leaves sets the mood to make it a Disney Fall and Halloween Season!